RFU students during a surgical orientation at RFU’s Center for Advanced Simulation in Healthcare at Centegra Hospital-Huntley, IL. RFU's new center for advanced simulation in healthcare is helping to train and develop healthcare professionals who learn and practice in teams to improve patient outcomes. 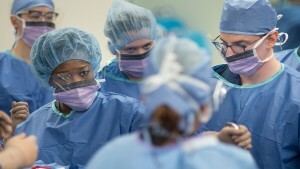 An early investor in simulation-based learning across its clinical programs, RFU is partnering with Centegra Hospital-Huntley in McHenry County, IL, to use "sim" to improve patient safety and health outcomes and to expand its interprofessional (IP) team-based model of education and practice. "We're advancing our IP mission not just among our own students but among other providers and professions," said James Carlson, PhD '12, MS '01, vice president for interprofessional education and simulation. "We have honed over the past decade a mission and a vision that support IP education and teamworking. We have honed it as integral to our culture. It's what the future looks like for us." The university is "planting the seeds" of IP teamwork, Dr. Carlson said, by expanding the role of simulation outside its formal portfolio of programs and more aggressively engaging health system partners around the IP concept. The Center for Advanced Simulation in Healthcare is a high-tech training ground for RFU students and faculty and Centegra health professionals who use the 30,000-square-foot virtual health system for optimal team practice in an environment that's safe for both patient and learner. "It might be an EMT in the ambulance bay or a nurse in the ICU caring for a patient with an asthma exacerbation and they don't execute a solid handoff," Dr. Carlson said. "We debrief on the clinical knowledge. We talk about the codified steps for engaging on the handoff to the next provider, or the huddle at the beginning of the shift to decide who will manage which cases in a busy ER. Students and professionals in different disciplines step up to lead. We're teaching situational leadership as opposed to traditional models." We’ve created a culture that graduates... clinicians who will be the force of change to improve interprofessionalism in real healthcare settings. The center, which opened in summer 2017, features an entire floor of simulated space, including an outpatient clinic, operating theater and procedure rooms, emergency department with ambulance, trauma bay and ICU, and an inpatient unit set up for labor and delivery and adult and pediatric simulations. Learners use programmable patient simulators, state-of-the-art medical equipment and electronic medical records for documentation and charting. They also practice clinical skills with standardized patients. "It's an across-the-board quality initiative but it's also an environment that's very conducive for training teams because of its high fidelity, its realism, its multifunctionality," Dr. Carlson said. "It's a powerful tool in our efforts to formalize the education around teams and teamwork roles, communication, group interaction, how leadership is executed. While health care in some places has probably been provided by teams, in large measure it has historically been provided by groups of people. We're trying to move group to team by formalizing structure and training." Centegra Hospital nurses use the sim center, sometimes with consulting physicians, to gain experience in rapid response, including simulations of hypertension during labor and delivery and the treatment of patients with sepsis and respiratory and cardiac problems. "We're able to work through the protocol as a team, collaborating on next steps as the patient condition changes," said Amy Druml, MSN, RN-BC, Centegra director of operations and professional practice. "It's real-life practice — without a real patient — in real time. We continue to grow in expertise, in creating scenarios and enhancing them to get the best experience for users as they learn processes." The sim center is also helping Centegra meet the credentialing needs of its physicians and advanced practice providers. RFU nurse anesthesia faculty, led by Franklin McShane, DNP, CRNA, department chair, recently reviewed with doctors the use of ultrasound to place central venous access and establish peripheral access. On-site delivery of the training and hands-on stations with simulated critical patients saved the health system valuable clinical time and expense. "Working with Centegra allows us to take IP teams and the product they produce — in this case a clinical skill set — out to our community partners," said Dr. McShane, who also practices with a surgical team at a rural Wisconsin hospital. "It really shows our community partners what can be accomplished by working in IP teams. We're always smarter as a team than we are as individuals." Dr. Carlson notes that the IP team, which improves provider morale and patient outcomes, is an evolving concept for many healthcare systems that are interested in pursuing the model but question how to implement it. "There's no road map," he said. "I think that's where we can be of great value as a university, but not as an open-ended solution. We've created a culture that graduates — and the metrics show this — clinicians who will be the force of change to improve interprofessionalism in real healthcare settings. Does Centegra embrace that? Yes. And I think we can help them and be a partner on their journey to advancing that. "It's going to be incremental steps," Dr. Carlson added. "It's going to be a change in generations training a certain way, deploying that training as they mature as clinicians. That will lead the change. Practice habits are hard to change. And even when there's a will, clinicians and the systems in which they work need the opportunity to develop the skills and methods to facilitate that change."